The Webwereld site, syndicated by IDC's English Computerworld, claims that "Apple and its lawyers have, perhaps inadvertently, misled the judge of a Düsseldorf court by filing flawed evidence of the similarity between the iPad 2 and Samsung's Galaxy Tab 10.1 tablets based on an inaccurate picture." 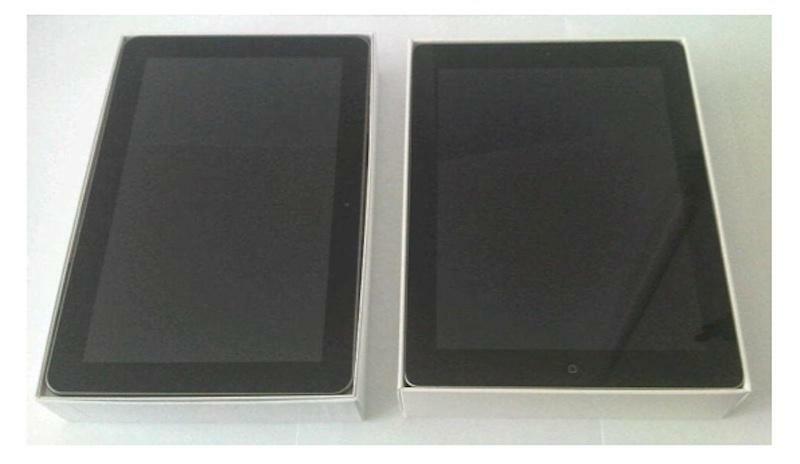 The picture in question depicts the Galaxy Tab 10.1 next to an iPad 2, with a distorted screen ratio that makes both tablets appear to have the a closer aspect ratio than they actually do. In reality, Samsung's Galaxy Tab has a widescreen orientation ratio of 1.46 (like most other Android tablets), while the iPad is closer to being square at 1.3. In the graphic, the Tab is presented as appearing to be 1.36, making it look more like the iPad than it actually does. Because of its wider ratio, the Tab is often presented in its landscape orientation, while Apple depicts the iPad in its tall, portrait orientation most of the time. Shown in different orientations, the two devices look even more different, as Webwereld depicts in its critique of Apple's complaint. The Dutch site performing its investigation into the matter couldn't say whether Apple had deliberately changed the photograph to make the Galaxy Tab look more like the iPad than it actually does. Blogger Florian Mueller was cited by Computerworld as saying that "picture in the German complaint could be of a pre-release prototype," but the graphic could also have been provided by Samsung in its marketing materials as an attempt of its own to make the Galaxy Tab look like a suitable replacement for the iPad. Neither Apple nor Samsung would comment to the media on the graphic's origins. Interestingly however, Apple's complaint (originally written in German and embedded below article; citations translated into English here) makes no mention of screen ratios. Instead, it describes a strategic effort by Samsung to "slavishly imitate" Apple's striking product designs in a way that violates Apple's "valuable commercial rights." The copying began, Apple's complaint states, in 2010 with Samsung's Galaxy product line. Apple says it met with Samsung last August to inform it of its concerns over copycat smartphone and tablet designs, but that the company continued to roll the products out into a variety of jurisdictions, including the USA, Japan, South Korea, Australia, Germany and the Netherlands. Apple's complain reveals that a court prohibited Samsung from selling the Galaxy Tab in Australia before first producing copies of the device to Apple for examination, because Samsung "would give no information about how the proposed product for Australia would differ from the US version, which is identical in all material respects to the version recently introduced to the market in Korea." Samsung previous stated publicly that "no injunction was issued by the court and the parties in the case reached a mutual agreement which stipulates that the variant in question will not be sold in Australia." In reality, Apple demonstrated the currently shipping American version of the Galaxy Tab 10.1 to the court, which Samsung construed as being "a variant" that it "had no plans of selling in Australia," because the Australian version hadn't shipped yet. Apple's complaint says the company spent $691 million in global advertising expense last year to help establish the iPad as a well known brand and product. It then recounts the ways that Samsung designed its Galaxy Tab 10.1 to "look just like the iPad, instead of developing its own style." The complaint states that "the design of the iPad, in its original and in its current [iPad 2] version, differed from the design of previous mobile computing devices. No other computer product which preceded the iPad, looked like the iPad." Apple added that the iPad "expands on design elements which originate from other products of the applicant - In particular the iPhone - to transfer elements of this unique and innovative Apple design to a new class of tablet computer products." In contrast, "before the introduction of the iPad," the complaint states that "the market for tablet computers was relatively small, and the products on the market were expensive, heavy and rather unwieldy," as it depicted in various photos to the court. "The shape of the iPad heralded a new era of tablet computers," the complaint continued. "The design is so distinctive, that if someone in the public has or uses an iPad, it is immediately recognized as such," and as an Apple product. The complaint directs attention to pictures of tablet devices introduced before the iPad, which look "entirely different from the iPad." - if the product is switched on, colored icons within the display. iPad 2 carries the same design elements ahead, with a slimmer profile, Apple notes, preserving the immediate recognition of the device as distinct from previous tablet products or conventional computing devices currently on the market. "Against this background," Apple states it "still has no copies of this [Galaxy Tab 10.1 for Europe] Product and therefore relies on both the representation of the product in the CHIP-report and the other above-mentioned publications, as well as on the design of the products of Galaxy Tab 10.1, as it was purchased outside of Europe." Because Samsung has presented its tablet to the media for review and started advertising it in Europe while apparently refusing to discuss any concerns with its partner and competitor, Apple said it decided to seek an injunction in Europe. "Since no product samples are available," Apple's complaint states, "pictures of the Galaxy Tab 10.1 are reproduced as it was tested by TecChannel." 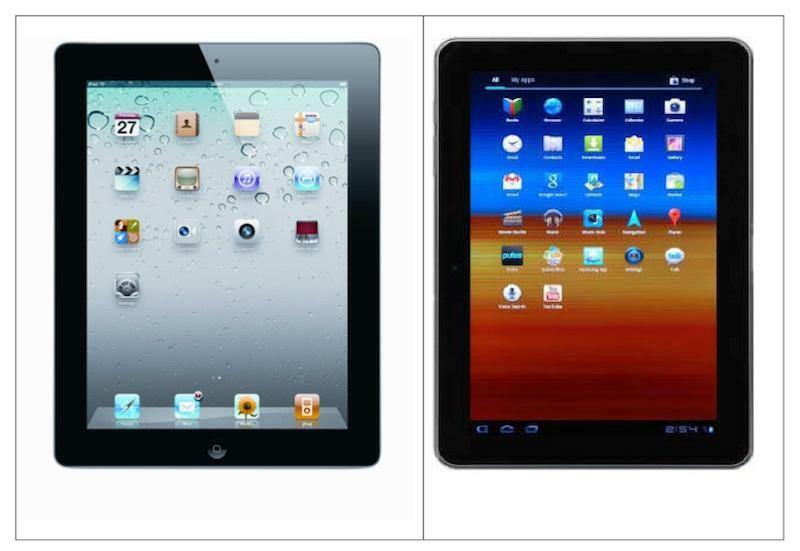 This indicates that the graphics Apple used in the complaint are derived from other sources, making it even less clear who changed the depicted ratio of the Galaxy Tab in one of the two dozen pictures included in the complaint. 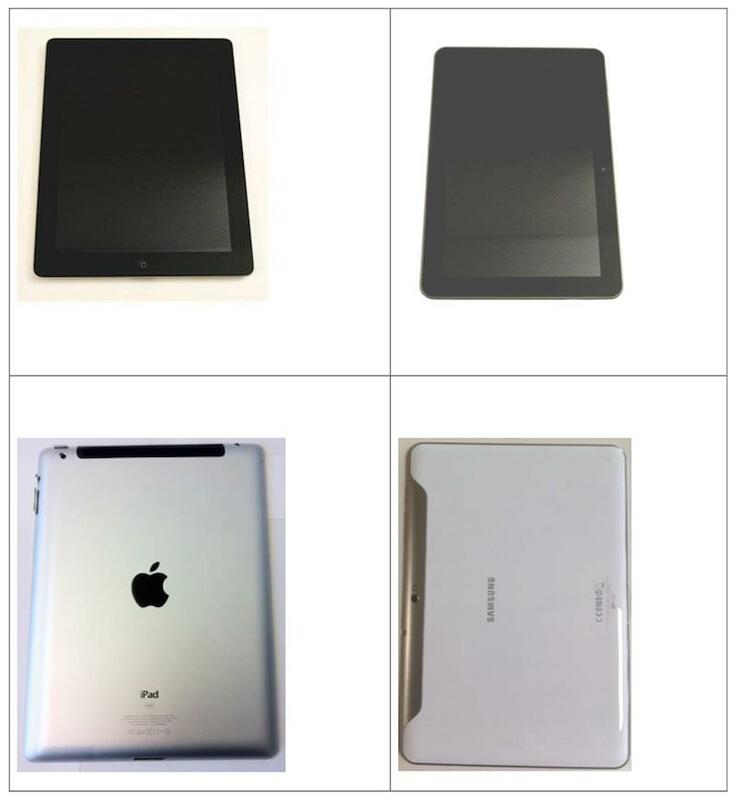 Apple produced a series of photos of the Galaxy Tab 10.1, describing it as "an obvious copy of the equipment of the second iPad" with the previous stated design elements "almost identical" and "making the same impression" as Apple's registered European Community design 000181607-0001. The photo in question extracted from the complaint by Webwereld (depicted above) is then presented as evidence that the Galaxy Tab 10.1 copies the iPad in every respect that Apple described above, ranging from its shape to its look to its materials, screen positioning and so on. Again, there is no mention of the Galaxy Tab having a similar screen ratio. Apple complains that "the overall impression of the front is almost identical. There are no differences in the Tab 10.1 to leave it recognizable as a product from the iPad 2." The complaint adds, "however, the similarity is not restricted to the front, but also extends onto the back, the top and bottom." The complaint also details that "the dimensions of the two products are very similar. (iPad 2 (width / height / depth): 241.2 x 185.7 x 8.8 mm; Galaxy Tab 10.1 (width / height / depth): 257 x 175 x 8.6 mm)," making no effort to suggest that the Galaxy Tab 10.1 is any closer in dimensions to iPad 2 than it actually is. Apple also states that "copying also extends to the product packaging - not only in terms of color and the overall external appearance but also in terms of presentation of the inner packaging. The overall impression of the products is therefore almost identical." Apple notes that Samsung's Galaxy Tab box not only copies the same photography, colors and reflective text, but even lays the device into a identical tray as the iPad and the iPhone packaging before it. Apple then cited examples of reviewers and media sources making comments such as "Samsung has given up trying to design innovative tablet design," "Samsung has always copied everyone, not just Apple" and "Samsung's B + mentality: Find a successful product, copy it." The company even cited Lee Don-joo, the executive vice president of Samsung's mobile division, who earlier this year acknowledged that the original Galaxy Tab 10.1 design was "inadequate" after seeing the release of the iPad 2, and noted that the company would "will have to improve the parts that are inadequate" on the model it had just shown before actually bringing it to market, noting that "Apple made it [iPad 2] very thin." "It should be noted in passing that copying the iPhone design by the defendant is just as obvious," Apple notes, adding that "against this background there can be no doubt that the Galaxy Tab 10.1 is distributed with full Intention of being a copy of iPad 2, to unfairly take advantage of the good reputation of this product and therefore [Apple] the applicant." The iPad's reputation as being a high quality, luxurious, attractive product is particularly at issue in the case, as attempts to take advantage of an existing company's reputation by selling a knockoff product that creates confusion with a well known brand has been addressed earlier by the German Supreme Court in cases involving Rolex watches and Les Paul guitars. Apple's complaint therefore has little to do with the aspect ratio of the screen and everything to do with the shape, presentation, design, packaging and overall identity of the iPad that it is accusing Samsung of "slavishly" copying.